Pixelocity Software has just released a cool new update to both Disc Drivin’ and Disc Drivin’ HD that allows players to do some customizing. 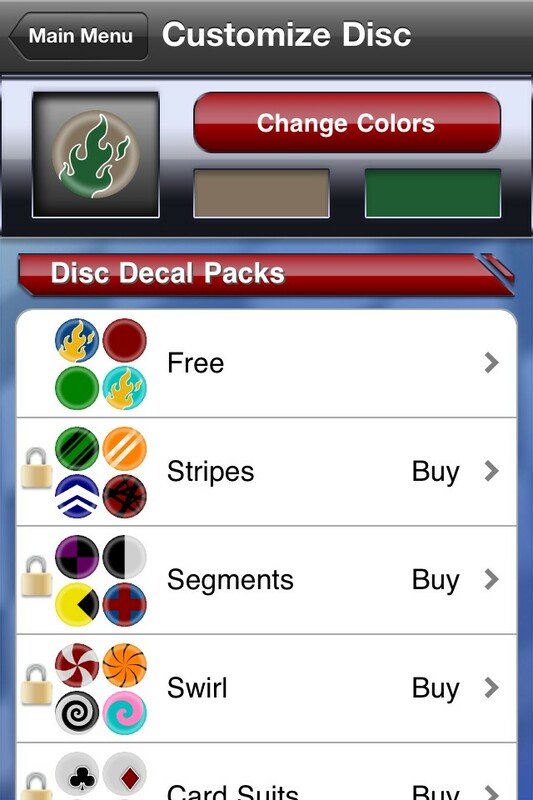 First off, players can switch the design of their disc to a single solid color, or change the decoration and background colors of the traditional flame design for FREE. If that’s not enough for you, you can purchase any of the seventeen new 99¢ DLC packs, each of which contains at least 4 different designs which can be color customized as well. These range from numbers to patterns, stars to swirls and even sports balls. Best of all, if you purchase one of these customization packs, they are tied to your account, meaning they are available across devices and app versions. Buy it once and use it on both your iPhone and iPad releases of the game! You can even change your colors and then tap on a decal pack to see how it would look (with those colors) before buying. So give your disc a little personal flare and character all your own. Also in the v1.8 update is the ability to swap the power button positions. Being a righty, I’ve had no issues with the current positioning myself, however I suspect that any south paws playing the game will be happy to hear of this option. Finally, you can now see your complete first second and third place stats on the Settings screen to get an idea of how well (and how much) you’ve been playing. Now here’s what you really came for…to celebrate the update, the guys at Pixelocity have been kind enough to give us two copies of the (paid) iPhone release and two copies of the iPad release to give away to our lucky readers. Leave a comment below, saying why you’d like to win a copy AND which format you’d prefer (iPhone or iPad). “Like” the AppAddict.net page on Facebook AND leave a comment on the post for THIS contest letting us know which format you’d prefer (iPhone or iPad). The giveaway will run until 11:59 PM EST on Tuesday Aug 23, 2011. Winners will receive their codes shortly…we’ll have loads more giveaways in the future so better luck next time to those who didn’t win.